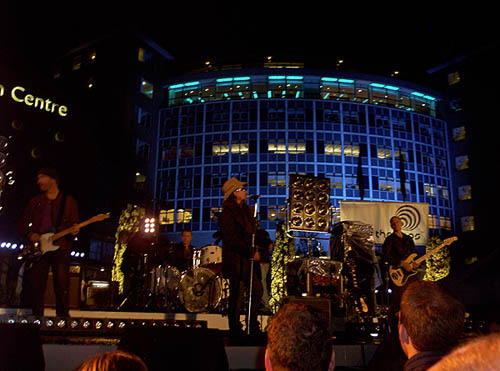 The band played “Vertigo,” “All Because of You,” “Desire,” a short version of “She’s a Mystery to Me,” and “City of Blinding Lights” outside the BBC Studios tonight. U2Exit.com, as always, have .WMV video of the performance of “Vertigo,” which was performed with live vocals by Bono in front of a pre-recorded musical backing track (a la “Beautiful Day” in 2000 and all Top of The Pops appearances). We’re assuming the other tracks were full-on live, but since they’re meant to be used on future ToTP performances, perhaps they weren’t… Bono, much to our amusement, wore a straw cowboy hat and a pimpalicious fur coat. Hmmm. The view of the stage from the street was great. It was a grim, rainy night with about 350 elderly (i.e., over 21) fans gathered behind the BBC gates. Sleepy commuters in buses were looking out of their windows and wondering what was going on. BBC employees were constantly filtering out of the building, and motorists picking them up had no idea why they couldn’t get into the area. U2 came out and rehearsed “Vertigo,” “All Because of You” and “City of Blinding Lights,” offering a bit of banter in between the performances. The sound quality was appalling. You could only really hear Adam’s massively distorted bass and Edge’s effects track. Bono’s vocals fluctuated considerably. After the rehearsal, perhaps half of those gathered outside left, thinking it was over. I stayed by accident. After a short while, the band returned to the stage. The sound quality seemed better, but it was still almost impossible to work out how “All Because of You” and “City of Blinding Lights” sound. Hopefully, it was the dreadful mix that made them appear weak. With the rain, the sound quality, and people leaving, the atmosphere behind the gates was surprisingly subdued. This made the whole event all the more bizarre and surreal. “She’s a Mystery to Me” came out of nowhere. Bono gave a long intro to “City of Blinding Lights,” perhaps to fill time, but unfortunately it was inaudible. At the end, Bono said, “See you next summer, when it will still be raining,” and then everyone pottered off down the road to the Tube station. In front of the stage, the sound quality was brilliant. All the songs were definitely played live, although “Vertigo” seemed to be a playback. There was no account of the under 21 rule specified in the U2.com contest. Most of the U2.com winners were over 21. Nearly everyone I spoke to lied about their age on the competition entry (me included). The new songs were amazing, and also prior to the band entering the stage, low in the mix of the PA was the new U2 album being played. The playback reached track 3 (“Sometimes You Can’t Make It On Your Own”), so I got to hear “Miracle Drug” and the first 10 seconds of “Sometimes You Can’t Make It On Your Own.” The playback was quite low volume, even for those standing directly in front of stage. Most fans didn’t even realise that it was HTDAAB being played! The usual U2 crew were present: Willie Williams, Joe O’Herlihy, Dallas Schoo, Sam O’Sullivan, and Stuart Morgan. I spoke to Willie Williams, and he said he watched the band record live renditions of “Vertigo” and “Sometimes You Can’t Make It On Your Own” in the studio earlier in the afternoon. He thought the reason for the latter was that it would be recorded for later broadcast, so “Sometimes” may be a single release in the future. They performed “Vertigo” in the studio because of the threat of rain, which could have caused problems for the live broadcast. Willie was very amused that he had found the Tardis from the Doctor Who series, which he placed just in front of stage amongst the competition winners. 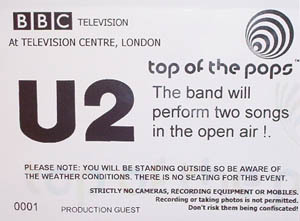 Just as the TOTP “Vertigo” bit was being announced, Bono had started imitating a Dalek, “Exterminate. Pop Music, Exterminate,” which amused the audience. 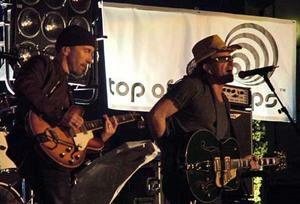 Willie also answered some questions about the upcoming U2 tour. He said he has already given the band lots of ideas about the stage design/theme. The problem is that they like them all, so at this point, he doesn’t know what it will be like! Additionally, he told me the tour would start in March, and then said it was, in fact, March 1st in USA. He confirmed that the USA tour will be a mixture of indoor and outdoor shows, but Europe will be outdoor only. Bono also talked about “She’s a Mystery to Me” and how it was written in London. He did an impression of Roy Orbison coming to meet the band backstage and asking if they’d ever consider writing a song for him.